Loaders from all series, Liebherr at this year’s NordBau. Whether bulk loading, road works or construction waste recycling, Liebherr offers for every application the appropriate wheel loader with diverse applications. A highlight among the exhibits is the new all-wheel loaders L 526. In April, the new and improved generation of the medium range, world premiere. Targeted investments in the strength and durability strengthen further the reputation of the new medium wheel loaders as versatile all-rounder. From the large series, Liebherr L 550 XPower and the L 566 XPower. The Compact loaders L 506 and L 508, and especially mobile Stereoloaders L 507 and L 514 complete the appearance of Liebherr wheel loaders at NordBau. On NordBau 2016, Liebherr L 526, the smallest of the new all-wheel loaders generation. An efficient, 103kW / 140PS diesel engine powers the loader. The NordBau-exhibit is equipped with parallel kinematic for industrial applications and a 4,0m³ Hochkippschaufel.The parallel kinematics is ideal for heavy equipment, such as the high tip bucket and offers the large torque in the upper Hubgerüstbereich. When L 526 are operating weight and tipping load in a balanced relationship. With an operating weight of 11.250kg the NordBau-exhibit reaches a tipping load of 7.700kg. Liebherr presented to the professional audience the new generation of medium wheel loader for the first time at Bauma 2016. This includes a total of three models, the L 526, L 538 and L 546. The new all-wheel loaders meet the emissions standards with Stage IV / Tier 4f. The proven and efficient hydrostatic drive convinces continue its special fuel efficiency. With targeted investments in the robustness Liebherr has prepared the new all-wheel loaders for multiple applications of different industries. For an even better durability of equipment Liebherr used on all three models in the previous generation more axes. This feature automatically acting self-locking differentials, and therefore even on rough terrain for maximum traction. 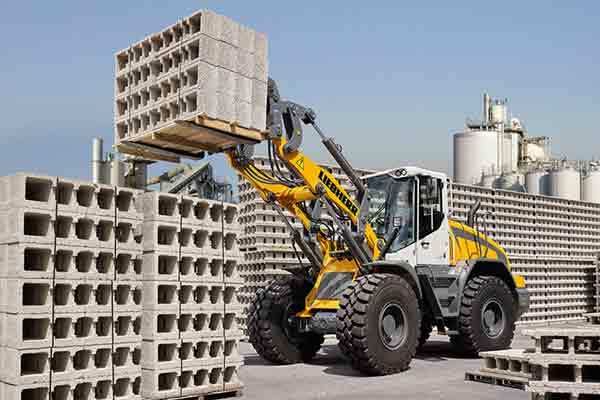 To extend the versatility, Liebherr offers numerous application-specific solutions. Some customers between Z-kinematics for standard inserts and parallel kinematics can choose for industrial applications. For high comfort standards, the developers have revised the cab holistically. A broad rise, the generously proportioned interior with thoughtful details, large and low-edged glass and window areas and easily accessible maintenance points ensure maximum comfort and safety. 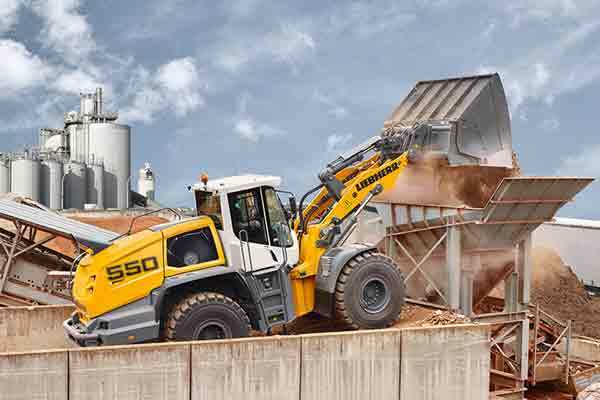 L550 XPower and L 566 XPower: Robust, powerful and comfortable In the development of Liebherr loaders XPower the robustness of the equipment was a particular focus. The L 550 and L 566 XPower XPower represent at NordBau the large wheel loaders from Liebherr. The L 550 XPower has a 165kW / 224PS diesel engine and is equipped with a Z-bar linkage, and a 3,2m³ Erdbauschaufel. The enhanced and revised Z-bar linkage is the best choice for standard inserts and provides up to 20 percent more breakout force compared to the previous generation. XPower bulk loaders mark a milestone in the history of technology of Liebherr wheel loaders. The heart of the XPower loader is Stage IV / Tier 4f compliant power split drive, standard offers the Liebherr in these machines. It combines the best of the short loading game hydrostatic drive to the mechanical drive whose advantages are at long distances to fruition. This combination ensures maximum efficiency and outstanding fuel savings of up to 30 percent compared to the same size class loaders. The intensively tested Liebherr drive system XPower represents robustness, since the performance unfolds through the interaction of two drive paths. The load is thus distributed to both drive paths and the components have a much longer service life. In addition, each XPower loaders gets stronger axles compared to the previous generation. Part even the axes of the respective next larger model of the previous generation. In addition to the axes strengthened Liebherr other core components such as the hydraulic cylinder and the mast. For maximum comfort, Liebherr has developed the cabin design in close collaboration with riders. Thanks to the large glass windows and the cabin offers excellent visibility. The interior is logical and generously structured. Display, controls and driver's seat forming an ergonomic unit and can be adjusted individually. With the compact loaders L 506 and L 508 and the Stereo loaders L 507 and L 514 Liebherr presents a total of 4 representatives from the segment of small wheel loaders. With the Liebherr compact loaders entrepreneurs are safe, convenient and reliable construction machinery available. The compact design makes the loader very flexible in the use and ensures a high degree of stopping and steadiness. Thanks to the low vehicle height of less than 2.5 meters, the compact loader from Liebherr can be transported easily and quickly. On NordBau Liebherr presents the Compact loader L 506 with Z-kinematics and 0,8m³ Erdbauschaufel. The L 508 with Z-bar linkage is equipped with a comprehensive 1,0m³ Erdbauschaufel. Liebherr Stereoloaders are distinguished by their special manoeuvrability with the unique stereo steering - a combination of articulated steering and steered rear axle - achieve Stereoloaders an up to 20 per cent smaller turning radius compared to other loaders the same size class; measured on the outer edge gives the potential savings of up to half a meter, in densely populated and urban areas, this clear advantage on the feasibility of a project is decide.